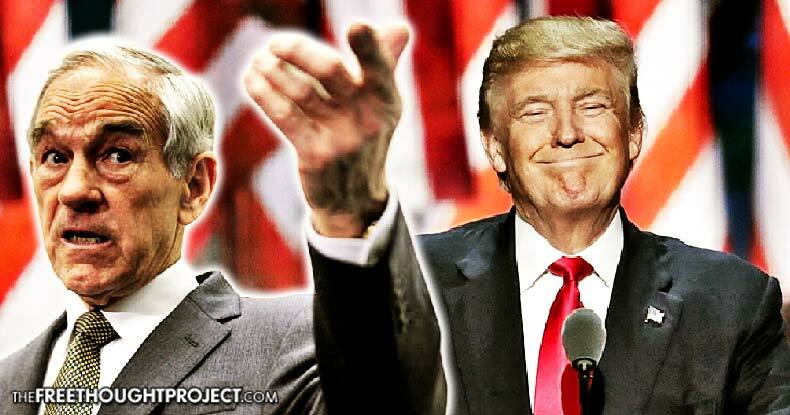 Champion of freedom and liberty, Dr. Ron Paul, decided to grade President Donald Trump’s speech last night, in real time. The final result of his series of tweets is nothing short of incredible and highlights how blinded some have become to the grandiose persona of The Donald — ignoring all his broken promises and audaciously excusing his championing of the police and warfare states. When I saw the following tweet in my Twitter feed last night, I got giddy like a kid on Christmas as I know that Ron Paul is the one person who refuses to compromise on principle and is unafraid of backlash for calling out the hypocrisy and warmongering of the establishment — including Trump. I am going to be Tweeting @realDonaldTrump #SOTU2017 – and giving him a report card! Opening up his speech, Trump promised to increase military spending. In fact, he announced this week that his administration will increase the already massive and bloated military budget by a whopping $54 billion. Massive new spending on military and infrastructure. More drug war. Where's the money? Fed will print it! After expressing his support for the massive creation of debt using the Federal Reserve, Trump went on to champion his executive order that granted Energy Transfer Partners permission to take treaty land from Native Americans and grant it to big oil. Again, Paul called out the hypocrisy in such a move. Building pipelines? OK but hopefully without use of eminent domain (property theft)! “To protect our citizens, I have directed the Department of Justice to form a task force on reducing violent crime. I have further ordered the Departments of Homeland Security and Justice, along with the Department of State and the Director of National Intelligence, to coordinate an aggressive strategy to dismantle the criminal cartels that have spread all across our nation,” Trump says. As we reported yesterday, the Trump administration just announced that they will abandon DoJ investigations into police as Jeff Sessions, who hasn’t bothered reading any of the investigations, thinks it’s a waste of time. Instead of taking problem cops off the street, the DoJ, under the tyranny of Jeff Sessions, will blow wind back into the sails that is the immoral, inhumane, costly, and deadly war on drugs. A great idea to reduce violent crime! How about stopping government violence at home and abroad? Great wall on southern border? Hopefully not to keep us in. Reduce incentives to illegally cross and change foreign policy! Problem solved! Merit-based immigration is a good idea. No welfare magnet for illegal immigrants would work well too. In perhaps my favorite tweet of the night, Ron Paul answered Trump’s fear mongering of “radical Islamic terrorism” with logic and reason instead of islamophobic emotion. As the Free Thought Project has reported on extensively, US foreign policy creates terrorism. These people don’t “hate our freedom” — they hate our bombs blowing up their children. It’s called blowback Trump, you should research it. Protect against "radical Islamic terrorism"? Can't do it until you understand concept of Blowback! Non-intervention would make us safer. “According to data provided by the Department of Justice, the vast majority of individuals convicted of terrorism and terrorism-related offense since 9/11 came here from outside of our country,” Trump spewed his carefully crafted sentence to make it seem as if terrorism in the US mostly comes from Islam. However, as we’ve pointed out on many occasions, Trump’s travel ban did not restrict individuals from the countries who actually committed the acts of terror. And, white Americans who carry out mass shootings and horrid acts of terror are almost never charged with terrorism. Ron Paul went on to warn against Trump’s ominous promises to strongly vet those who want to travel to the US. As the travel ban has already shown, innocent Americans are ensnared and humiliated by its aggressive implementation. This will only get worse. Strong vetting system – is it a step to a Real ID card — an attack on our civil liberties and privacy protections. In true neocon fashion, Trump then went on to swear his allegiance to the state of Israel and promise more war — this time with Iran, who hasn’t attacked another country in centuries. “I have also imposed new sanctions on entities and individuals who support Iran’s ballistic missile program, and reaffirmed our unbreakable alliance with the state of Israel,” he said. More Iran sanctions? Sounds like preparation for war against Iran to me! 'Biggest increase in military spending in history' – bad, bad news. And nothing for defense, all for militarism. Then, Trump went on to shamelessly promote the police and warfare state by carefully selecting audience members whose violent inner-city tragedies he could exploit. Again, Ron Paul blew his police state argument out of the water. If you really want to reduce the violence in our cities…get rid of the drug war! On top of the victims of inner city violence, Trump also shamelessly exploited the widow of the Navy seal who died in the botched Yemen raid — as a disgusting and overt blasting of warfare propaganda. Trump went on to lie and call the raid in Yemen a success, in spite the slew of backlash he got for it and the fake ‘intelligence’ the Pentagon got exposed for promoting — that was a decade old. Again, Ron Paul shredded him. "Highly successful raid" in Yemen? In many ways the raid was a disaster! A waste. Criminal what they are put through for political reasons. Warmongering is alive and well. Tragically. Focus on the widow. What a terrible use of tragedy for political purposes. Our war in Yemen has nothing to do with US national security. Unconstitutional for us to be bombing that country! After running on a platform to get the US out of NATO, Trump, like all politicians do, switched his stance and began to promote it. “We strongly support NATO, an alliance forged through the bonds of two World Wars that dethroned fascism,” he said. Militarism gone wild. It's all going off the rails. Strongly support NATO? I though we were getting out! Trump then hilariously claimed that the US respects the rights of all nations, while simultaneously supporting the massive military industrial complex spreading through more than 100 countries across the world. “Free nations are the best vehicle for expressing the will of the people –- and America respects the right of all nations to chart their own path.” he said. Ron Paul took that opportunity to state the obvious. Nations can chart their own paths? Good! Then we can bring our troops home from 120 countries! At the end of the speech, Ron Paul gave Trump letter grades on his visions and how he intends to get there. Trump failed. His methods to achieve it? He gets: F.
Never said audit the fed. No spending cuts. More foreign intervention. Word "liberty" not mentioned once. Thank you, Ron Paul, for your unwavering support of liberty, even in the face of popular ignorance. As for those who supported Trump for all the items he’s since reneged on, it’s time to wake up. Trump, like all other puppets before him, are subject to the unelected shadow government which maintains control no matter who’s in the White House.